I needed to hear that just as much, if not more so, than her, but sometimes it’s easier to be brave as a parent when you feel like you’re being courageous for your kids. Our comfort zone is comfortable and that’s the problem. We get complacent. We think what we’ve got is good enough, and we forget our dreams. The past three years, I’ve had quite the journey with mine. I have become increasingly aware of, then frustrated by and now actively attacking my comfort zone. I step out of it, then it tries to pull me back in. It feels like a constant battle, and I’m ok with that because I know it’s a sign of progress. As Daniel Coyle suggests in his book The Talent Code, the only way to deepen skill and to transform ourselves is to push ourselves to the “sweet spot,” that area where we stretch our current mental, spiritual or physical capacity to the point where we have never been before. That means having a new (sometimes confrontational) relationship with our limitations and fears and also having head-on collisions with failure. If we are constantly pushing ourselves beyond our comfort zone and beyond our current abilities, then we are going to fail. We are ASSURED of failures. Do you know what comes with failures? Pretend for a moment that you’re training for the Olympics. What do you do after you barely lose a race to a competitor? You watch a video of the race, you see what they did, you see what you didn’t do. You’d playback everything you did before the race and during it over and over in your mind and you’d make a list of all the small and big changes you need to make before the next race. That is, if you want WIN the next race. Learnings come with failures. And learnings lead to new connections in your brain and body, which lead to…you got it, your never-ending improvement. This is not only true for the hard skills athletes need, it’s true for any improvement in any area of your life that you decide to stretch yourself in — a better relationship, a more fulfilling career, a happier family life, or simply conquering a fear that you’re tired of letting control you. 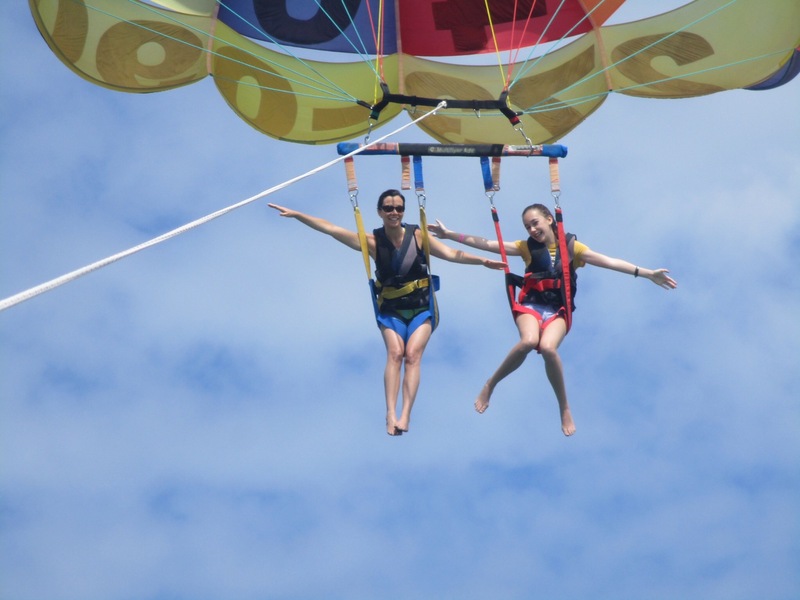 Isabelle loved parasailing, calling it, “So relaxing!” It took her less than a minute to change her mind and make a decision to go. It took her 5 seconds in air to decide it was cool. You can change, and you can get out of your comfort zone in a moment’s notice. You just have to decide to.